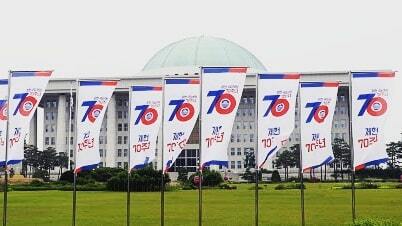 제70회 제헌절 경축식 국회 70th Celebration of Constitution Day at the National Assembly Building > TV보도 | Welcome to violinist Ji-Hae Park official website 박지혜의 공식홈페이지 바이올리니스트 박지혜, 바이올린(Violin) Violinist Ji-Hae Park 공식홈페이지!! KBS1에서 생방송 됩니다. 대한민국의 헌법이 개정된지 70년이 된 기념으로 국회에서 경축식에서 #화이트정선아리랑 #지혜아리랑 하나로 합친 #한아리랑 기쁘게 연주를 하였습니다. Celebrating the 70th #ConstitutionDay of Korea. It was very meaningful to perform at this special celebration in the #NationalAssembly building. This celebration is LIVE on KBS TV.